1. 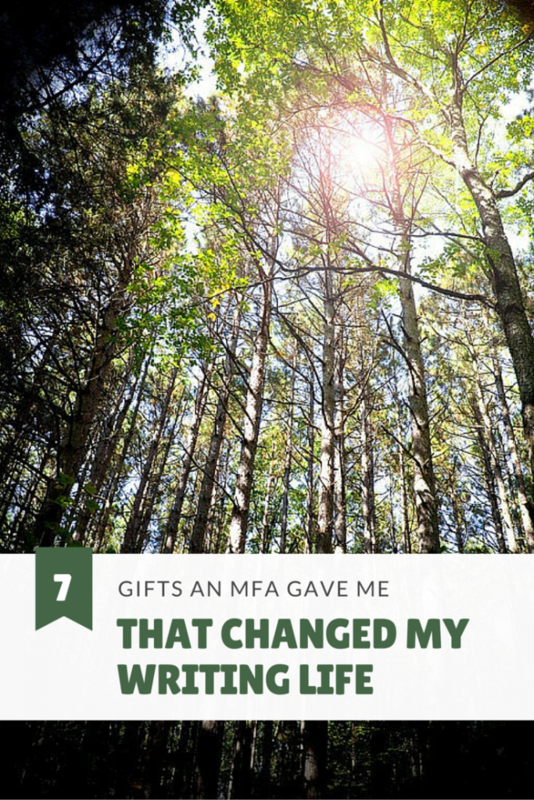 An MFA filled my toolbox with New Writing Tools and showed me how to better use the tools I already had. Was I pounding in nails with a screwdriver? What could I do with a jigsaw? I learned about psychic distance and filters, I re-learned plot and characterization and so much more. Could I have broken through my plateau on my own? I’m not sure. Maybe, with enough time and enough reading. And if an MFA only provided tools, then I might question the value. But the MFA gave me more than a single workshop or another book on writing. It gave me more than tools. Pre MFA my reading was all over the place. I’d go to the library, check out books based on recommendations or labels on the spine: Oh, Mystery! I want to write a mystery, too! As if I were looking through the lens of my DSLR set to manual with the focus ring turned the wrong way, all the world’s books looked the same. I never knew what new books were worth reading, or what old books were true classics I couldn’t live without. 2. An MFA provided Focus. 3. My MFA program helped me Become a More Versatile Writer. I once dreaded writing query letters. I agonized over the hook, wrote and rewrote a bio that sparkled while still being…true. Because while it looks great in a bio, I’m not a celebrity, don’t have a doctorate, and don’t have one single superpower. Unless Able to Scale Mountains of Laundry counts. 4. The MFA gave me a Credential, and with it Credibility. believed I’d be stuck in the slush pile forever. 5. An MFA Can Open Doors to the Publishing World. When I began the MFA I had no idea one of my classmates would go on to become an editor with a big house. I had no idea other classmates would find an agent who would happen to be a good friend of my agent. The industry is an interconnected web, and I wouldn’t be surprised to learn that my network of alumni stretches, somehow, to every publishing house on the planet. Alumni, faculty, we all work together, sharing knowledge, names, connections and yes, even stolen carrots. segmented life had only a small hole carved out for Me as Writer. 6 The MFA Gifted Me with Community. 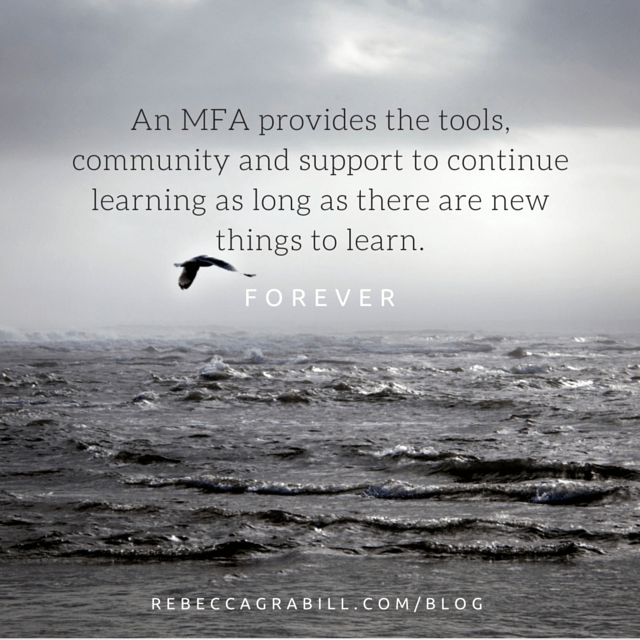 When I began the MFA I thought I knew everything. I’d read all the books (hadn’t I? ), I knew all the rules (didn’t I?). I was a great, or, um pretty good writer (wasn’t I?). Beneath the bravado a crippling terror whispered that I was a pretender, a hack. 7 Hamline’s MFA in Writing for Children and Young Adults Gave me Confidence. And Humility. Learning always builds confidence. But there’s nothing quite like seeing a whole universe of expertise—faculty, visiting writers and publishing professionals—to make me acutely aware of how much I didn’t know. Yet. Because I now have the tools, community, and support to continue learning as long as there are new things to learn. Which would be, in case you’re wondering, forever. Rebecca Grabill graduated in summer 2011 and has two forthcoming picture books, Halloween Goodnight (S&S 2017) and Violet and the Woof (HC 2018). She lives and writes in Michigan. Find out more about Rebecca and her writing at www.rebeccagrabill.com/blog. Terrific essay, Rebecca. I remember your first residency, your first shared work. I felt the power and energy of your new and scary beginning–I was awed by your talent and bravery and I felt very lucky to be in your workshop. I have always valued my MFA, but I love being reminded of why, and also of how lucky we are to have so much more to learn. I might not have known that without Hamline. Oh yes, and congratulations on your books! Rebecca, what an articulate, passionate piece on a topic that so many writers wonder about – is it worth the money? Thank you for taking time to share your wisdom. And to think you did with young children and another on the way … your essay should be given to all those who apply to Hamline MFAC.